Open from its hinged meridian to reveal antique replica frescoes inside. 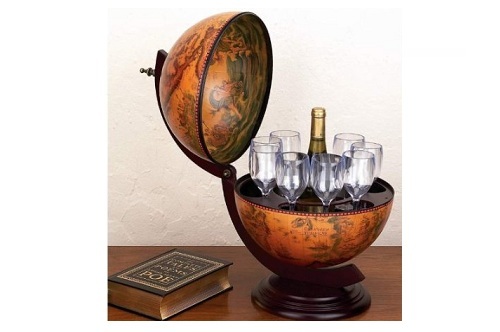 Wrapped with majestic 16th century replica nautical maps and integrated wooden table stand. Rotates on its North and South axis. Contents not included. Rotates On It's North and South Axis, Measures 20" Tall. Price: $61.44 & FREE Super Saver Shipping.